Someone comes up with another format to learn. 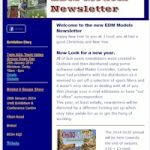 First off we introduce a new newsletter format which takes some head scratching to figure out. One of the consequences of this is that its narrow format, used so it shows up phones and tablets, is a bit restrictive when it comes to adding any articles actually about modelling. This is EDM’s first venture into the internet lark of blogging. All things being equal, the posts and pages on this site will support the content of the newsletter.